If you’d like to start our Love Story from the beginning, start here, if you want to refresh on the previous chapter, go here. MAKE SURE YOU SCROLL TO THE BOTTOM TO VIEW THE WEDDING VIDEO! Life is wonderful! We’ve been married 5 days, and I couldn’t be happier…I really want to document our wedding day, and though I know I could never do it justice, I must try. Our wedding day was perfect, I was calm and relaxed and happy, and everything I’d hoped it would be. I had a great sleepover with my girlfriends the night before I got married, and though I hardly got any sleep, I woke up at 6am relaxed and excited for the day! Laurie curled my hair and Natalie painted my nails. Matthew came to pick me up, with both of our parents in tow. I’d heard another friend did this, and I thought it was so sweet to all make the drive to the temple together, just the 6 of us. 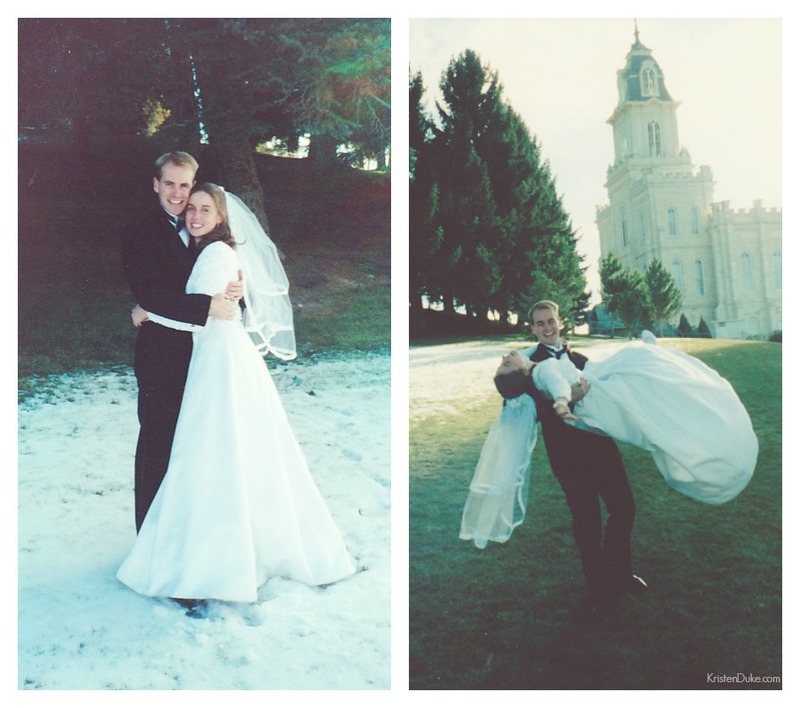 I had chosen a few months before to be married in the Manti LDS Temple, which was kind-of in the middle of nowhere. 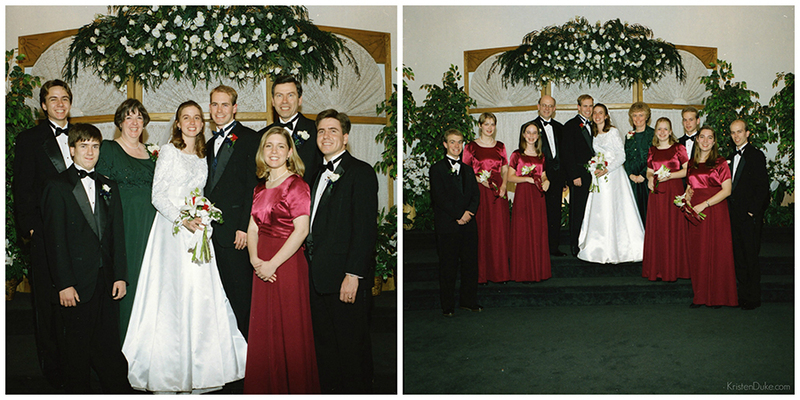 With Matthew being from California, and myself from Texas, some people thought it was odd for us to marry in Utah, even though we’d been living there at BYU, but it made sense to me because we really wanted friends to be there, and I had a good amount of extended family in Utah (grandparents, aunts, uncles, etc) as well. Inside, the ceremony is shorter than a traditional wedding, and only adults inside who have previously made similar covenants. It can be hard for some who have close friends or family not of our faith or not devout, but ultimately the couple chooses based on those details. Fortunately for us, all of our parents, grandparents, siblings over 18 were able to attend and go inside with us. 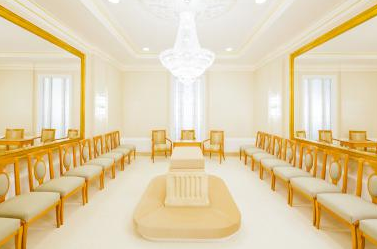 Here is a picture from the temple magazine (pictures are not permitted inside) of what is called the Sealing Room, which is where couples are sealed (together) or married. 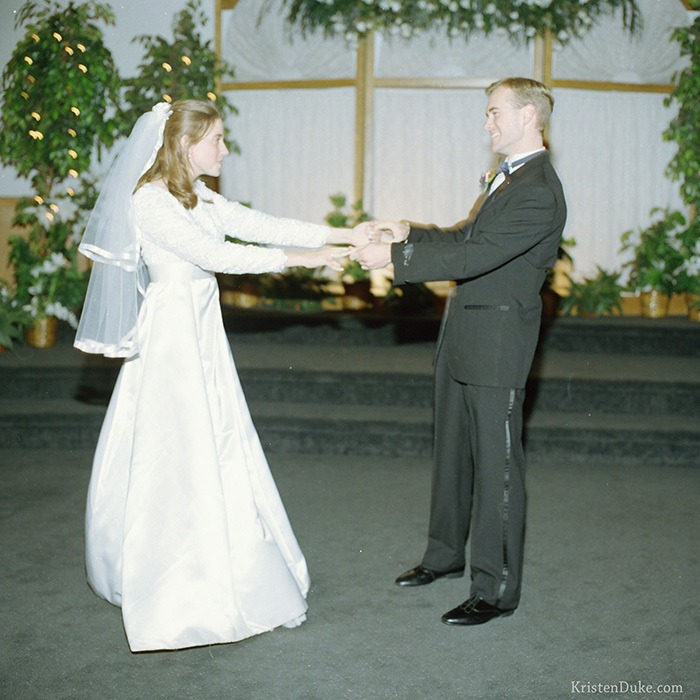 The couple kneels in the middle with loved once watching in the chairs. Though the nature of the ceremony is sacred and not for the internet, it’s special, and just as a similar marriage ceremony, the person marrying us will give us personal advice or stories or council which is individualized. I really love going to other sealings since then, and hearing what is said, and taking it back to better myself and my marriage. If you see the two giant mirrors on either side, it is often tradition that couples are told to face each other (in the middle) look in the mirror behind your partner, and you can see them infinitely but not yourself. That’s a reminder to think of your partner, and realizing you’re going for the long haul….eternity! 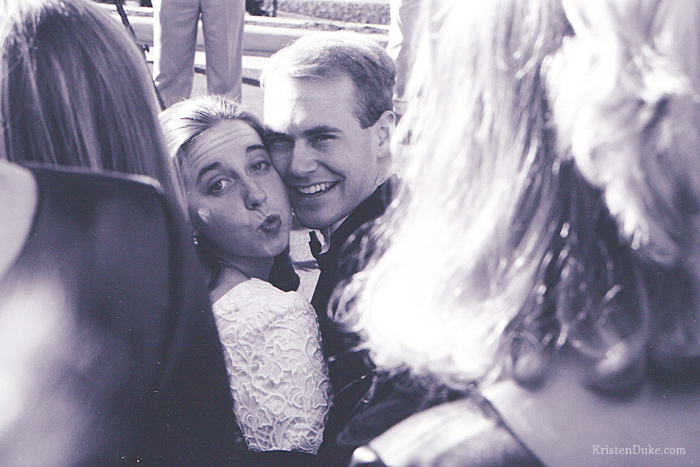 Besides the joy of marrying the love of my life, looking around at our friends and family who made it a priority to be there, was special to me. Only about 50 of our closest family and friends would fit inside the room. So many wonderful friends who were a part of our dating journey. It brought tears to my eyes to see all of them, they got it. They knew our journey like no one else. We got to hug each of them in the sealing room. I couldn’t even look at my bestie, Natalie, because she was tearful, and I knew I’d cry more if I did! 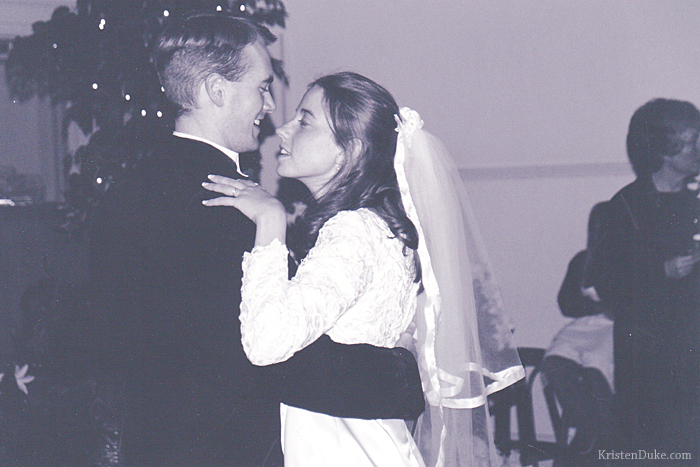 All of those years we dreamed together in high school of our future husbands…and there I was (she was already married). Hugs and tears and joy shared with each person who came to show their love to us. Our journey involved a lot of our friends, and it was a blessing to have them there, part of our extended family. It truly meant so much to me to have had so many people there that we loved, smiling at us, just the gift of their presence meant the world. Before we left the temple, I got touched up in the bride’s room with Natalie, Laurie, and my two mom’s. I then found my HUSBAND, looking so handsome and dapper in his tux, and we went out into the world waiting for us. Once outside the temple, the party began. 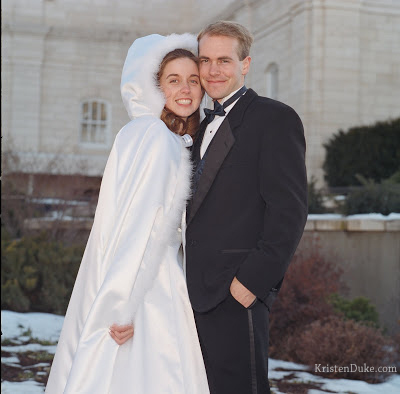 As we exited the temple doors, everyone greeted us with some cheers and blew bubbles at us as we made our grand entrance as Mr. and Mrs. Duke. Camera’s flashing from every direction, true papparazzi style. Stars at the beginning of our live movie. Little did my husband realize that those cameras would rarely be put away! Our siblings and close friends that were not in the temple gave us congratulatory hugs. 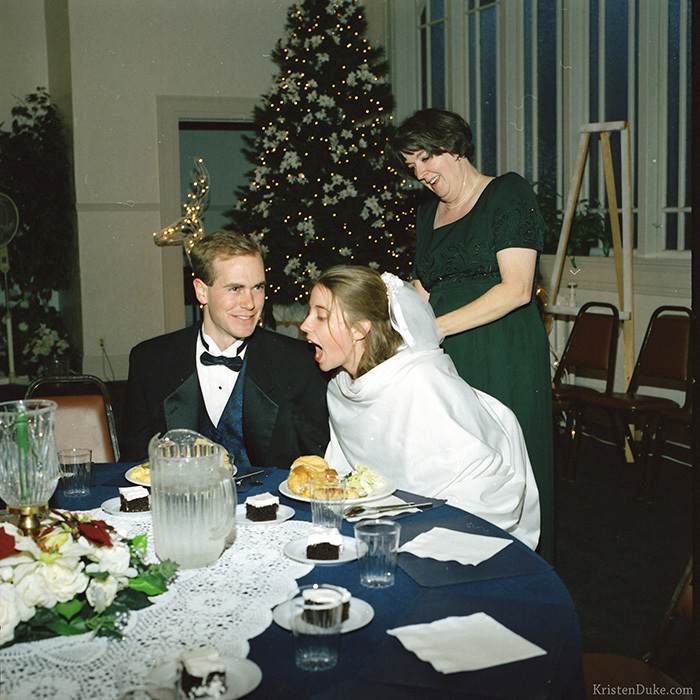 Back in 1999, digital cameras weren’t much of a thing yet. 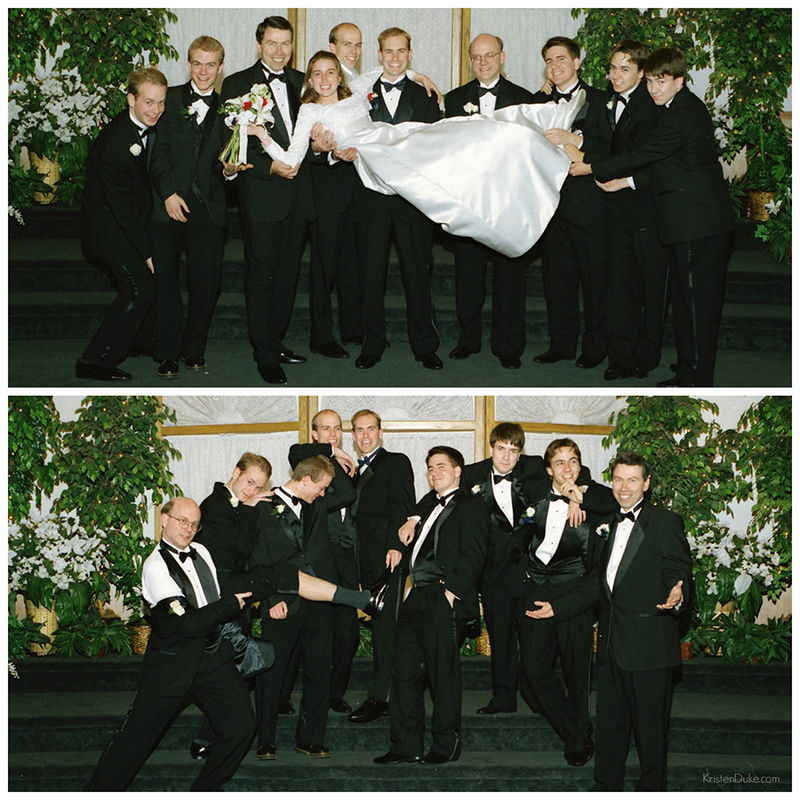 My photographer was a 50 year old man, and I used him because it was a package deal to the reception place we used later that night. Oh, how I would have done it different just a few years later. LUCKILY, I asked my awesome friend Laurie to take some candid black and white pictures, and those are some of my favorite images of the day. 4 rolls of black and white film captured from her! I was on top of the world….we did it…we actually got married!!! Though I was bummed to not have snow all over the ground as I pictured, it was so nice to have a warm day outside, which allowed us to get lots of great pictures. My mom made me a white cape lined with fake fur around the hood, which I just loved wearing. When we shopped months before, and I couldn’t find a dress I loved, the idea of wearing the fur lined robe made me giddy! After group pictures, we went off with the photographer for couple pictures around the temple grounds. He kept telling us to embrace “tenderly” and we joked about the cheesiness of it all! Two of my favorite pictures, below, were taken by my mom with her point and shoot, as she followed the videographer around (our photographer left). met up with our parents for the drive back to Provo for our lunch and reception. I really loved the place we chose for the reception, an old church turned wedding hall. For years, one thing I knew for sure is that I did NOT want basketball lines on the floor of the reception on my wedding day. Our church buildings have that, and I just didn’t want to see it. We would have it for the next two receptions in California and Texas, but I just didn’t want it this day. 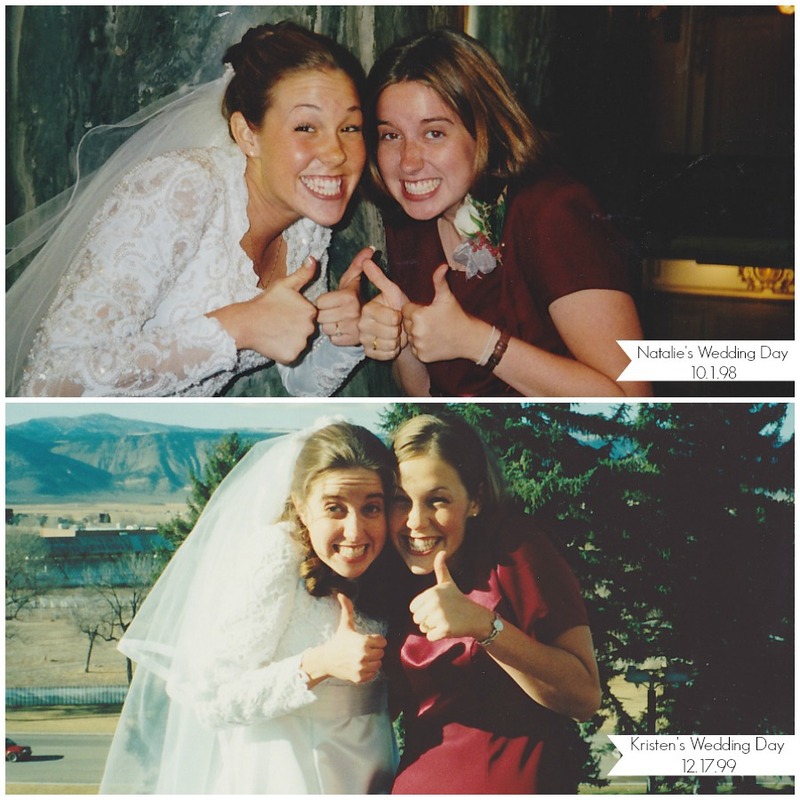 Below, my bestie Natalie and I at our weddings. I have these in a frame side by side in my office. For the next two hours, we ate with the people that came to the temple, then we received more friends and family who drove in from all over Utah to congratulate us: friends my from my Jerusalem study abroad, Matthew’s mission President, friends from Ricks college, some introducing me to fiance’s or husbands I’d never met, it was so much fun to see so many loved faces I hadn’t seen in a while! THEN, we got to dance to OUR SONG. “From this Moment” by Shania Twain really felt like it encompassed our relationship. With all of the back and forth and uncertainties, I really felt that FROM THAT MOMENT, we were forging forward without hesitation, and it felt so good. Ever since our engagement, it went smoothly without a hitch, and I can honestly say that the question mark was never ever there again. At one point, I thought it would be fun for us to sing together, but I couldn’t get the harmony to work. Instead, we danced alone to that song with everyone watching, I was quite theatrical and he joined me. Someone told him later that they said it looked like I really loosen him up. After all of the celebrations, I was feeling exhausted from the day as I went to change. Natalie helped me, and calmed me down a bit. 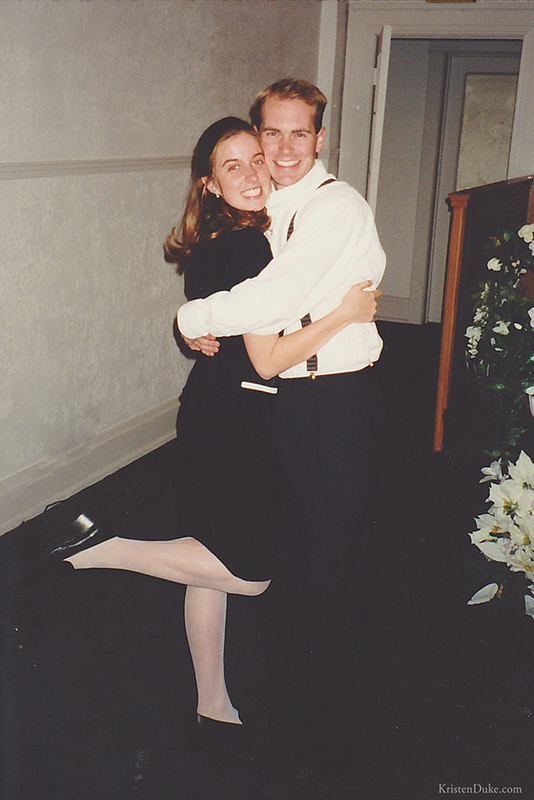 She had helped me pick out my “escape” outfit, a black and white skirt suit, and asked me if I was nervous…(you know, for the wedding night) and I told her I was just really excited and felt happy, not nervous at all. As we ran to our car amidst well wishers waving, I was a bit irked to find not just our car decorated, but a bit destroyed! 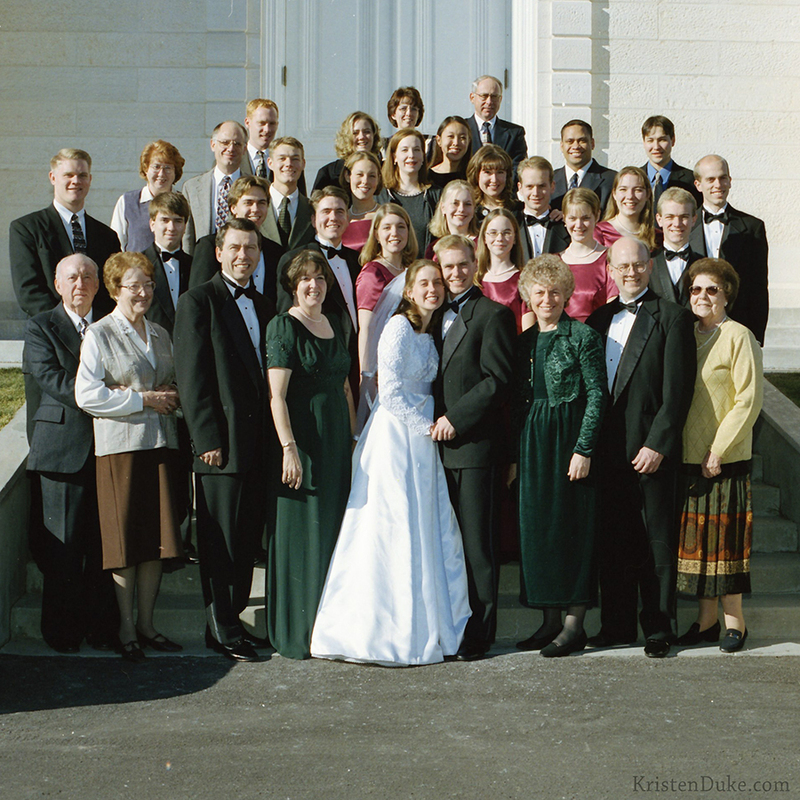 I had noticed our siblings sneaking off during the reception, and I knew it was going to happen, but they made it difficult to even get inside, as it was stuffed with newspapers and oreo’s stuck all over the outside. We drove down the street and found a dumpster to throw it all in, and scraped it off the best we could. We drove about 45 minutes, and up a canyon in Salt Lake to a destination Matthew reserved without my knowledge. We talked about the highlights of the day, the people we saw, and what a perfect day it was to start our journey. I felt so happy, everything was wonderful. The day was amazing, we were glowing, I just married the man of my dreams, my best friend, my forever companion, and he loves me back the same! As we drove deeper into the canyon, down a winding dirt road, we found ourselves at a secluded little cabin in the woods. We’ve got a wedding video! Do you want to see? Back in 1999, it was NEW, and when I saw this at a wedding expo, I had to have one. It was $400 at the time, and that was a DEAL they were giving me because they were trying to gain new clients. It was cutting edge, and I knew I’d love it and I still DO. Though they’ve come along way, I’m grateful I have this memory. 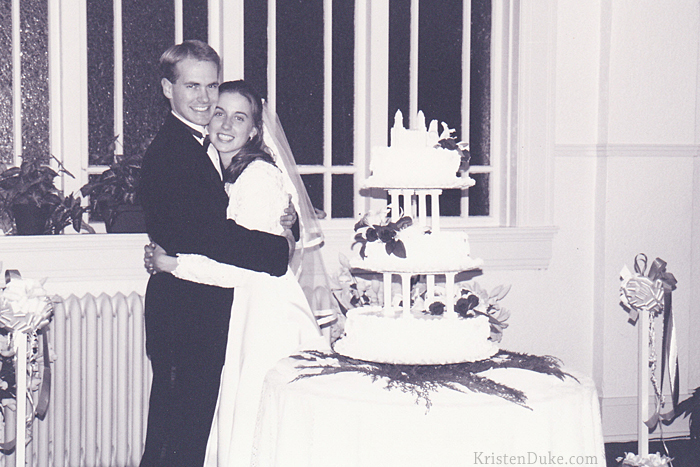 Wedding Video copy from kristen duke on Vimeo. 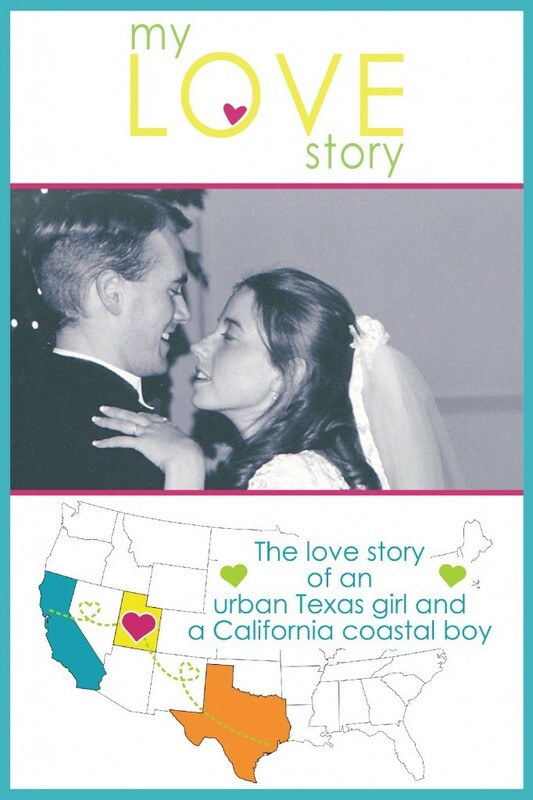 There you have it, my love story in 30 chapters! On this day, 12/17/17 my husband and I sat with our 4 kids and recounted this story for the first time in detail (it took nearly 2 hours including their questions and calming them down from the hype of aspects of the story). 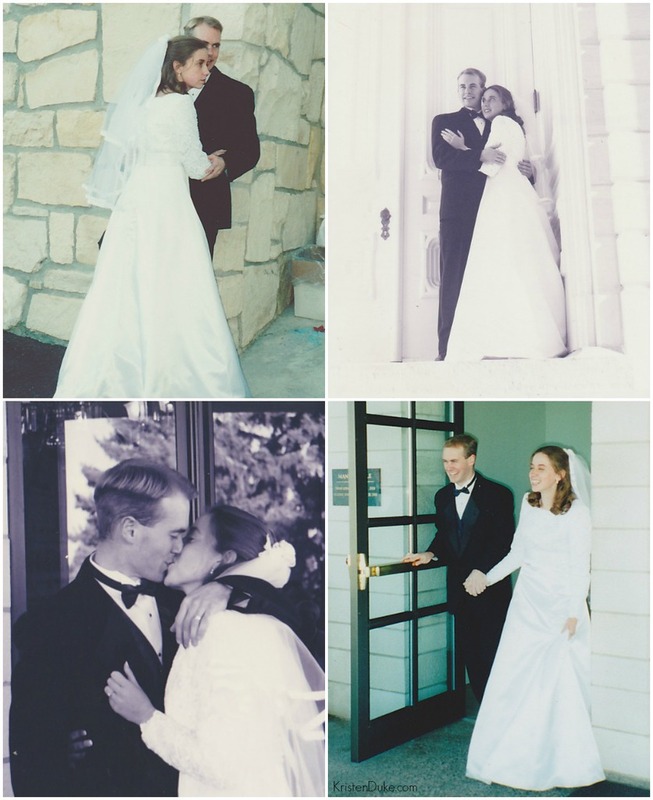 I wanted them to know it was a complicated journey, but it’s a beautiful journey, and I’m grateful for every twist and turn because it helped us both be SURE before the wedding day. 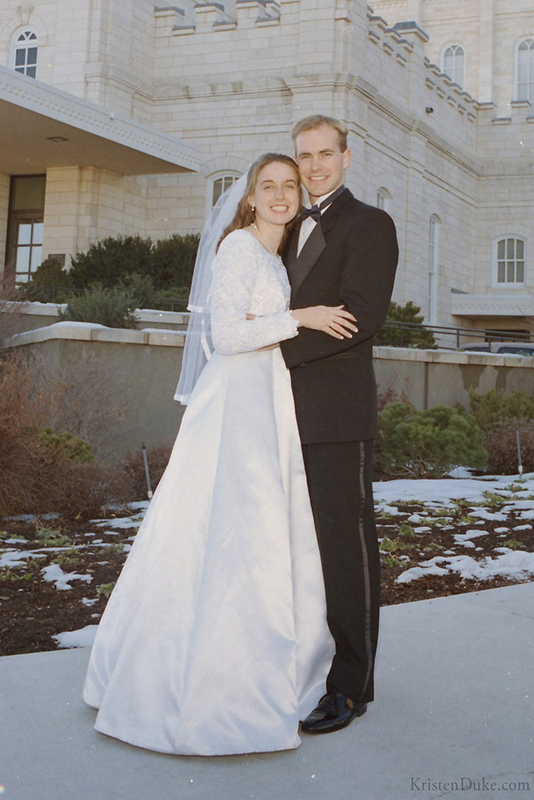 I want our kids to know it isn’t always “love at first site” that finding “the one” is more complicated than it often seems, but also what is most important is to look for someone who loves God as much as you do, and that all of the differences will pan out as you include God in your marriage. 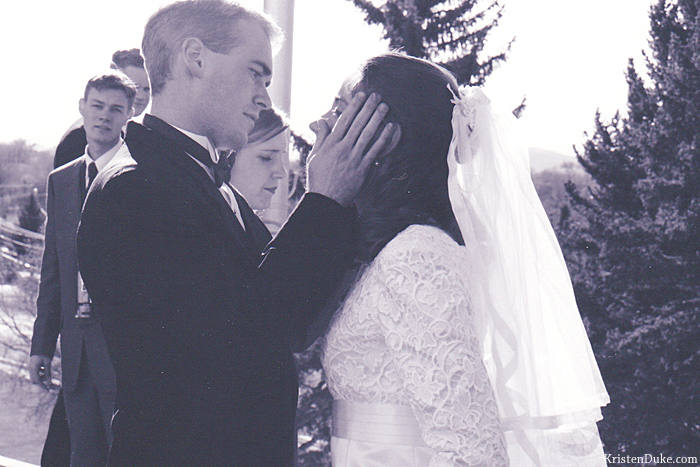 I’m grateful for my husband who looks to God for guidance, because it has shaped him into a great husband. 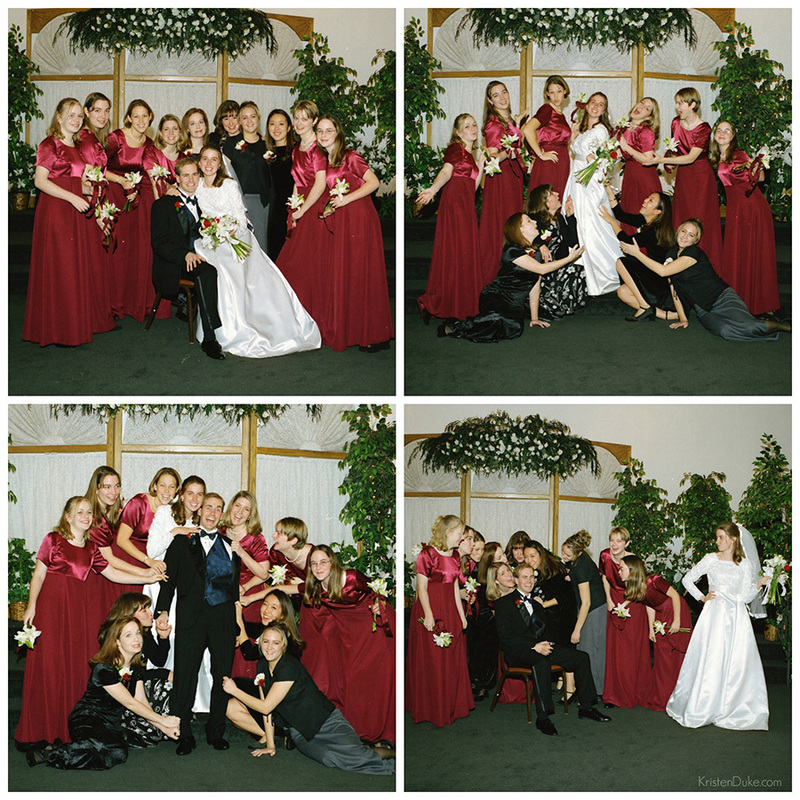 Wedding pictures from Sharpe Photography in Provo, Utah.